It was not a bad move at all. Far from it actually. It wasn't like the time when we moved during a torrential downpour, or when I had to navigate around a police barricade set up outside a neighbor's house, or when I lugged 60 pounds of shoes and books in my carry on through Heathrow Airport to avoid checked baggage charges while on en route to Amsterdam. This move stood above all others. It was easy as pie. Up the stairs, down the stairs, rinse, repeat. Our minimal belongings and my extensive mobile kitchen unit made it safely. The new place is beautiful and absorbed our things seamlessly. The complexity only started with one simple question posed to the new landlord, "How do we get our mail?" Suddenly, the burden of proof to receive mail was on us. Not the police, not the post office, not the company that has the opportunity to sell us internet service believed our address was real. The mere mention of our new street address was met with chuckles. This was truly a lesson in Eastern European bureaucracy with a little Mediterranean time swirled in. Permits had to be approved to build the building. Land had to be purchased. Construction workers had to be hired. Three other residents moved into the building before us. How could we be the first ones to ask this question? In discussing this important issue with one of our new neighbors, they seemed completely unconcerned as if it were all going to work itself out with any effort on his part. Another chuckle. By the end of moving weekend, lightning bolts were shooting out of my ears yet I still had to make dinner amongst the obstacle course of boxes and bags and mail angst. After eating out for a week due to a displaced kitchen and moving boxes, we couldn't do it anymore. The limit had been reached. We needed something comforting and uncomplicated, unlike our ability to get mail. 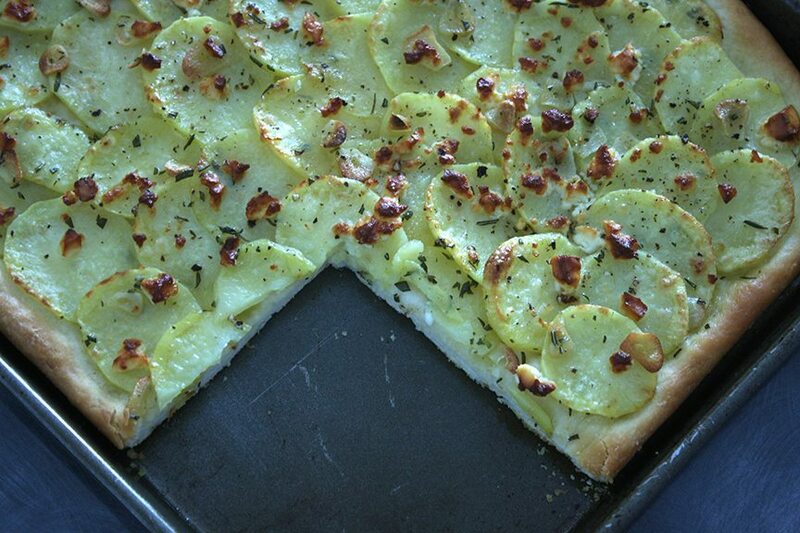 So I reached for a monumental glass of wine and potato, rosemary and garlic pizza. 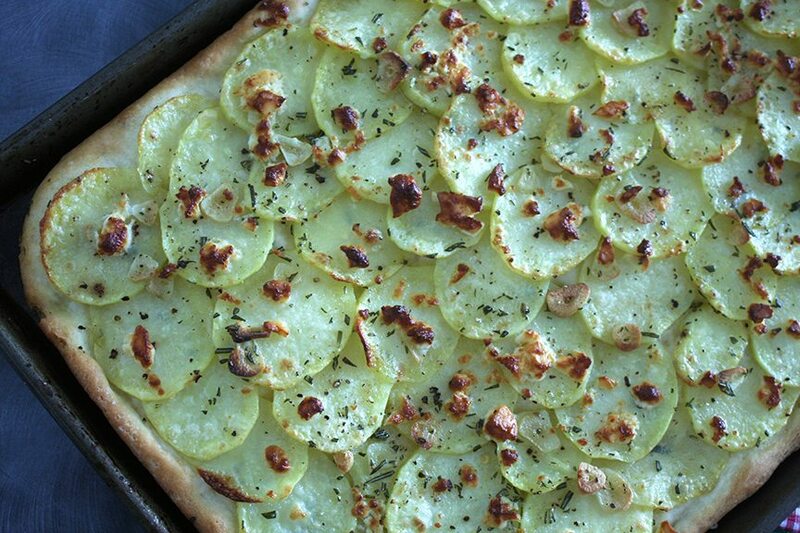 It's everything I (and I expect you) love about roasted rosemary and garlic potatoes, but on a cushy, crispy pizza crust. Olive oil-soaked potatoes, caramelized garlic, fragrant rosemary with a good sprinkling of sea salt and fresh pepper. And perhaps some cheese. At that moment, with the move fading into the background, there was nothing better than chomping into this pizza curled up on the new couch. Who needs mail? I certainly don't! All I need is pizza. And wine. Definitely wine. 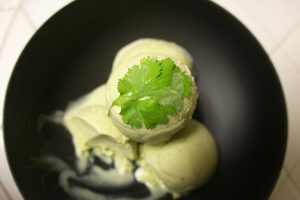 See step-by-step photos of this recipe on the Facebook page. Sprinkle yeast and sugar over the warm water. Let sit for 10m until creamy. Add olive oil to yeast and water mixture. Add flour and salt to a large bowl. Make a well in the center. 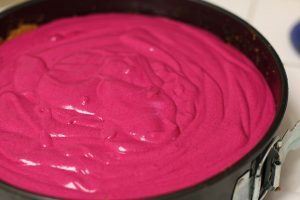 Pour in yeast mixture. Stir to combine (or use the dough hook of a mixer). 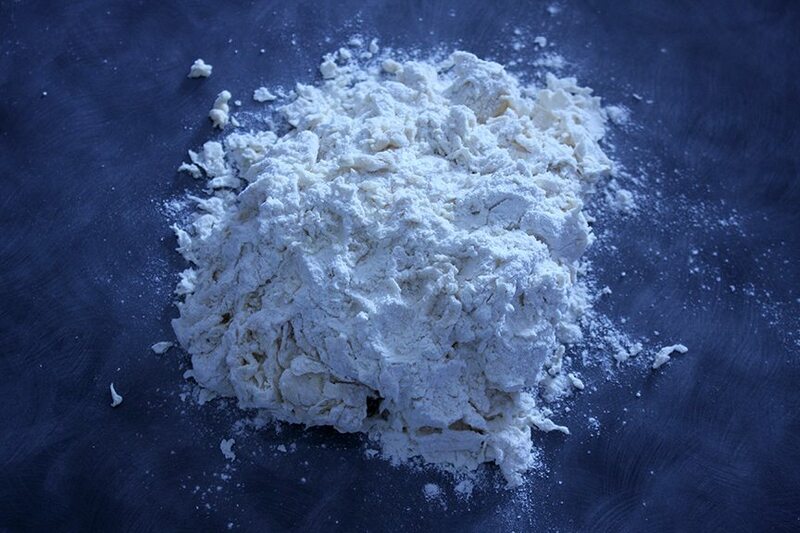 Once the dough becomes shaggy, transfer the dough and flour to your countertop or cutting board. 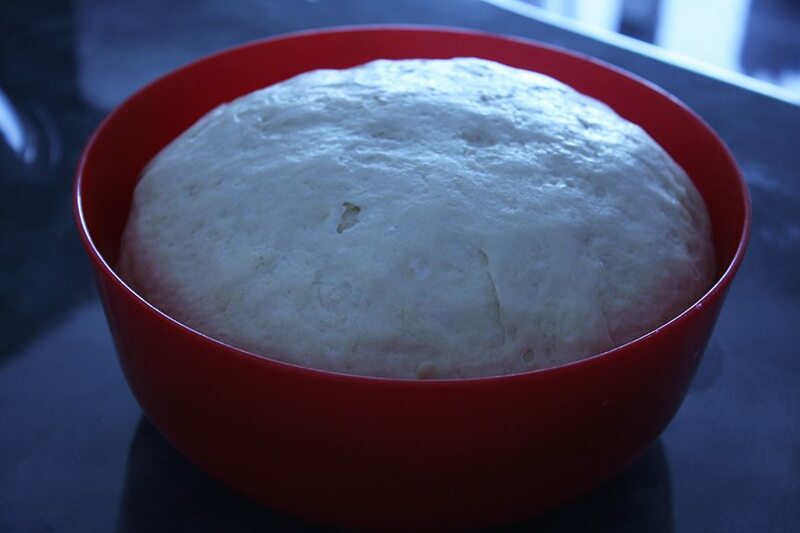 Knead the dough until it's homogenous, about 5 to 7m. The dough does not have to be perfectly smooth, it just needs to have all flour incorporated. Shape dough into a ball and transfer to a lightly oiled bowl. Cover loosely with plastic wrap, then a tea towel. Let rise in a warm place for 1 1/2 hours or until doubled in size. Once risen, the dough can be split into two. Knead each piece gently until smooth and shape into a ball. At this point, the dough can be refrigerated or frozen. 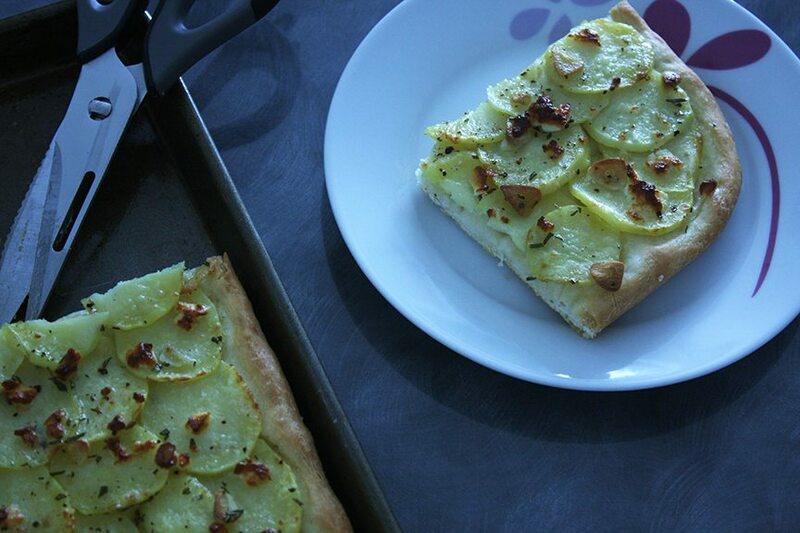 Drizzle a sheet pan with 2 tbsp olive oil. Roll or pat out the dough on to the sheet pan to your desired size. 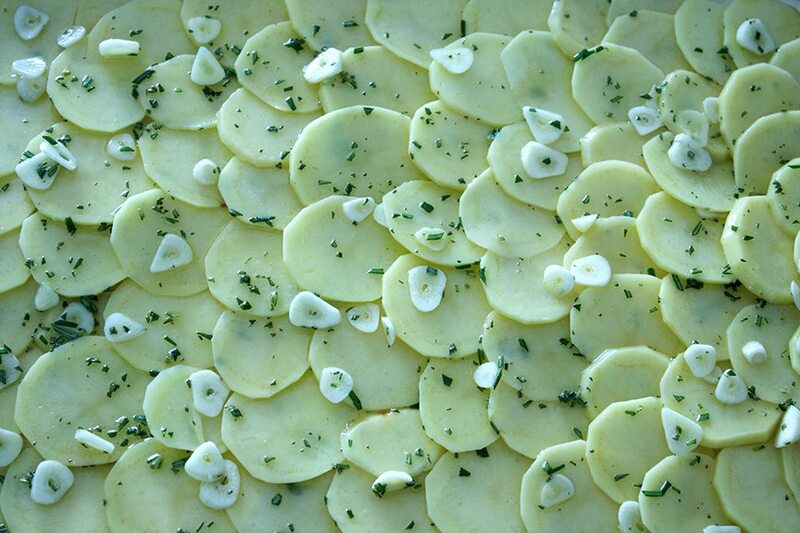 In a large bowl, combine sliced potatoes, sliced garlic, chopped rosemary and 1/3 c olive oil. 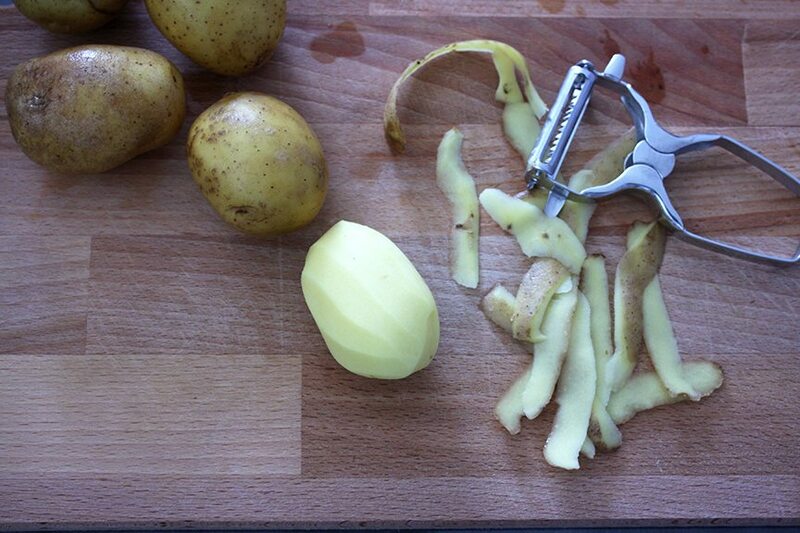 Toss to coat the potatoes. Set aside. Preheat oven to 500F (260C) or highest setting. 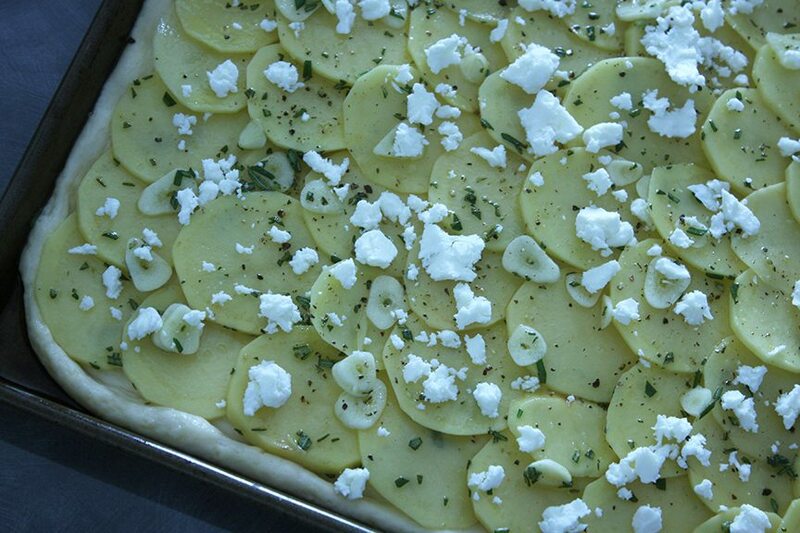 Layer the potatoes and garlic on top of the pizza dough, slightly overlapping. Sprinkle with salt and pepper. Potatoes LOVE salt, so don't skimp on the seasoning. Sprinkle with a cheese of your choosing. I used a goat's milk feta. 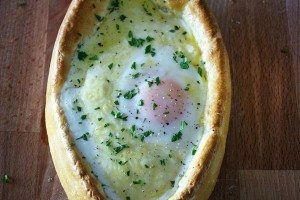 Bake for 17-23m until dough is golden, cheese has caramelized and potatoes are cooked through.